You know when you get a Slurpee from 7-Eleven and it’s a little too much for the regular straw? That’s my snow report for today. Dirt Slurpee. There were people snowboarding in t-shirts with their jackets tied around their waists just so they still had their lift tickets that were attached. Ian said, “Well ... yesterday was a lot better but today it looks more like salt than snow and I don’t think that’s as good.” I pointed out that this was his second day on skis ever and we come from tidal Virginia so we’re not snow connoisseurs. We went down “the short slope” next, my taking the lead so Ian could follow me. After a bit, I realized he’d fallen. I stopped. I tried to side step up the hill. I took one ski off and tried to side step that way. Nope. My skis sank into at least 6” of Slurpee. I was nearly that horse stuck in the mud from Neverending Story. So I just stood and waited. Ian tried to push himself up but ... Slurpee. So he took off both his skis, got to his feet, repositioned his skis, clipped back in and rejoined me. We continued to the small chair lift. So we took turns that way. When I fell on the long slope he stopped and waited for me. He said, “Good job!” when I was able to stand back up in Slurpee. And I said, “Yes! Go you!” when he made a great recovery. That’s how grief is for us. We have to take turns. We have to wait for each other. And if we can make it through this dirt Slurpee, we can make it through anything. As we sat down to dinner last night, Ian said, "I miss Daddy. I feel like I didn't do enough for him and his cancer. I feel like I should have done more to help him and I didn't do anything to help him!" He started crying. I reminded him that he was seven when his father died. He was two years old when his father was diagnosed. We didn't expect him to change ostomy bags. I told him that Daddy was not very good at asking for help from anyone, certainly not a little boy. What Daddy wanted more than anything was to pretend that cancer didn't exist. Every moment he spent with Ian, watching TV, playing, or cuddling, allowed him to pretend cancer wasn't there and he had his old life back. So Ian did everything he was supposed to do. You know how you talk about some product and then it's showing up on your Facebook ads? Just the other day, I was talking to a friend about how some people say I didn't do enough for Rich. It broke my heart to hear my sweet boy cry that he didn't do enough for his father. Things looked great for Team Stryker until 2016. That last year was a doozie. Not all of us made it out alive and there were many wounded. I can't make that clear enough that it was touch-and-go there for several of us. Calling me human garbage also doesn't bring Rich back, but you do you. One of the good things to come from the crucible of caregiving and widowhood is I don't care what most people think anymore. 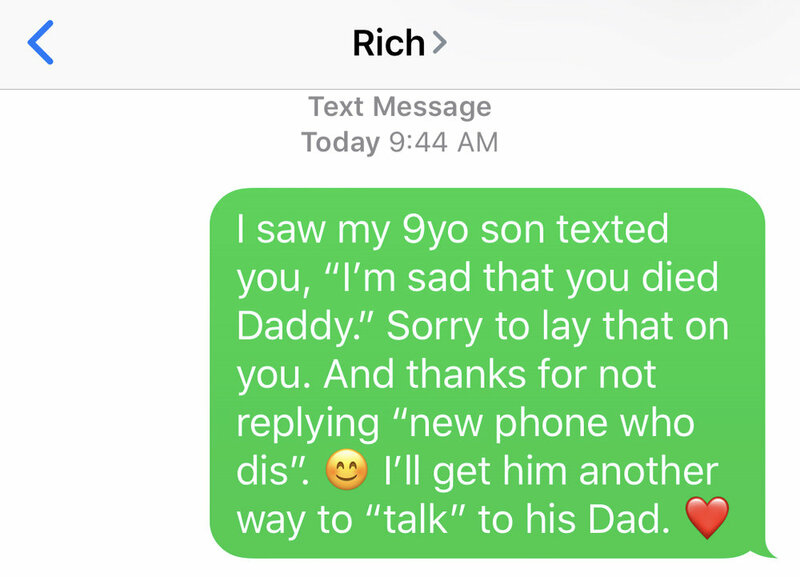 Yesterday morning I noticed Ian had texted Rich's number a few times. The messages failed at first but in the middle of December one went through. "I'm sad that you died daddy." That had to be one of the worst wrong numbers a person could get. I'm grateful they don't have read receipts turned on. It just said "delivered." I think they changed numbers since then since my message today went as a text versus iMessage. Maybe they didn’t want a dead man’s phone. I tend to talk to Rich in the car versus texting him. Days before the check engine light came up on the Suburban and I bought a brand new car, I was talking to him about our vehicle options. I don’t even mind that he doesn’t respond much. You should be able to memorialize a phone number, so texts don't fail but don't go anywhere. Just let the messages keep saying "delivered."